Gear and complimentary orientation are included with your day pass. Must sign a waiver before entering climbing area. Dress comfortably. Pants or long shorts that allow for a free range of motion are perfect. Rental harnesses and climbing shoes are provided if needed; socks that cover the ankle required to wear with the rental shoes. Climbing in sneakers or minimalist shoes (toe-style shoes) not allowed; climbers must wear climbing-specific shoes. 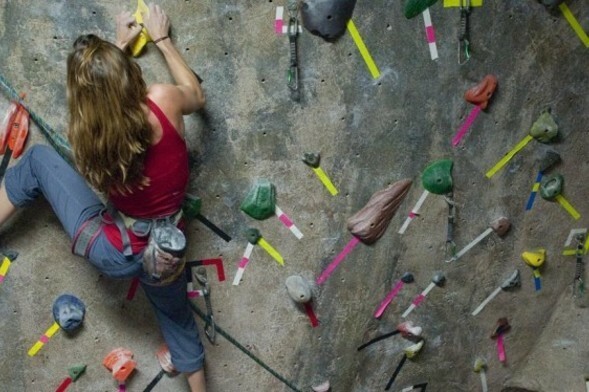 Indoor rock climbing is an amazing experience that is both fun and great exercise. People of all ages, fitness levels, and experience come to our gym every day. Rock Spot Climbing is a state of the art facility and our dedicated staff is top-notch. A day pass includes gear rental and complimentary Orientation which gets you right on the wall and is great for all ages, all abilities. We show you how to boulder and use our auto belay systems safely so that you can climb on your own. The day pass with gear rental is an all-day climbing pass, which includes an instructional orientation. Auto belays are devices which are located on select walls (currently 10-12 per gym), and mimic top roped climbing, allowing for solo ascents.